I do like Tyler’s rolled-eye expression of regret in panel 3. I wonder if the person off screen is talking about Cecil or something else. At any rate, I’m sure the next page will reveal their identity. Given they’re saying “them”, Occam’s Razor suggests to me the sprites of Law and Chaos that got left behind. I do wonder if it’s an art shift in style, or if the smaller heads in proportion to the kids’ bodies is meant to show they’re growing. Because it does make them look a bit older. Yes, that is exactly what I’ve been thinking. Yes, they do look older. Also, Ron’s hair colouring appears strange. I’m used to blue streaks drawn to emphasize black hair, but I’m not sure about light grey all around. I think that its an age indicator. 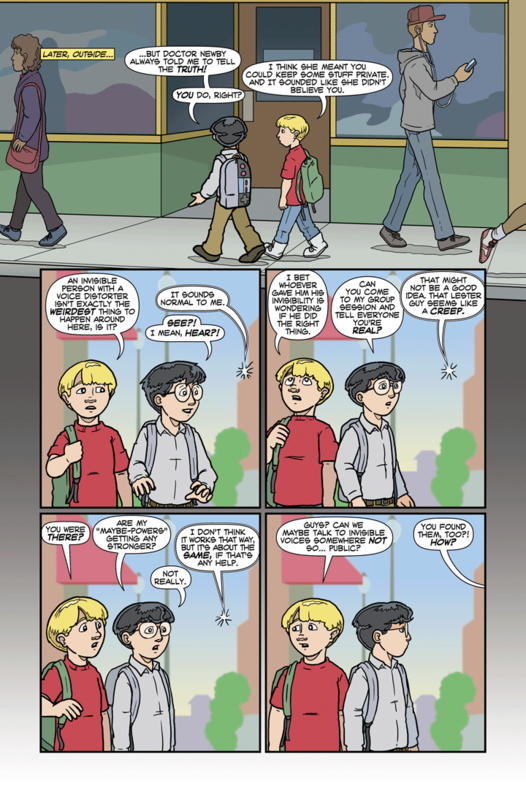 If you look at the last panel Tyler is also taller than Ron, and I’m fairly certain that that hasn’t happened before. I think it’s that we’re seeing a longer portion of their height. The camera cuts off at their waist, and before it seemed higher/more a closeup. Part drifting of his art style and part slick hitning of aging. We don’t want them to be 9-ish forever like the Simpsons. I wonder if Cecil got a “vibe” from the others in the group who’d lost their powers? I wonder if he was there under orders from You Know Who? Seriously, the old codger was only dangerous because he was audacious and the bureaucrats running the Wizarding world were willfully inept. I figure Cecil heard about the meeting, decided it was the Illuminati and resolved to crash it. And I love Ron’s knapsack. The spelling in my comment is really just sad. Darn you cellular devices! Oh, I think I know what’s happening. “You found THEM too?” I predict that the cloaked figure thinks Ron has found out about Power and Glory and cut a deal with them to get his powers restored as well. He/She was probably contacted the same way (via an invisible voice). The voice from off-panel sounds a bit concerned though — I wonder why? Is this a one-of-a-kind deal? Hmm…. Sooner or later they will all learn the meaning of subtlety. Well, Tyler Knows it, it’s just that he can’t get anyone else to practice it. This comment board gives me more trouble…! My guess is Victor or Zodon for the offscreen voice, and they’re not talking about anything the boys are talking about. I was wondering about the offscreen voices too. I don’t think it’s Victor or Zodon, but whoever it is, I think they’re probably talking about “Power & Glory, LLC”. Aaron has to tie the two story lines together sometime. Although I feel there’s an extra comma in that speech bubble. I’m only seeing the one, and every way I try to parse that sentence the comma keeps slipping in. Huh. Now I wonder if Lester is meant to be this story arc’s antagonist by somehow regaining his gauntlet/powers? Alternate theory: One of the ex-supers regains their powers and serves as this story arc’s antagonist by doing a face-heel-turn, whether unintentionally or intentionally, possibly with a past-the-moral-event-horizon thing? Twist: In latter scenario, Lester actually helps foil said antagonist despite his bitterness to not having his powers. One thing this storyline is making me think of: the opposite scenario to ex-supers wanting their powers back. I’m talking the people/stories where the supers wish they’d never had power or would gladly give them up to be normal and ordinary again. More that with great power comes the ability to act on who you are inside rather than who you present yourself to be. In the hands of Spider-man a single empowering bite allowed a bullied kid to rise above that and fight back for all those who need protecting, in the hands of Molecule Man a bullied kid lashes out at the world and seeks to conquer it in revenge for the abuses he suffered (until he finally gets the help he needs to overcome that). I can’t help but think Cecil’s proceeding from a misconception here. He’s never run into a meta that lost their powers so how does he know the “vibe” doesn’t stick around afterwards? (Of course, if it turns out he didn’t get vibes from the people in the meeting who’d HAD powers and lost them, that would answer my question right there, wouldn’t it?